Pre-clinical study suggests Parkinson’s could start in the gut. Parkinson’s disease is a progressive neurodegenerative disease with devastating clinical manifestations. Recent research on Parkinson’s disease has focused on the gut-brain connection, examining patients’ gut bacteria. However, researchers understand little about what’s happening in the gut which leads to the hallmarks of Parkinson’s, such as tremors, stiffness and trouble walking. Now, a study led by researchers from Duke University shows that inside endocrine cells which populate the small intestines is a protein called alpha-synuclein, which is known to go awry and lead to damaging clumps in the brains of Parkinson’s patients. The team hypothesize that an agent in the gut might interfere with this alpha-synuclein, deforming the protein, which could then spread via the nervous system to the brain as a prion, or infectious protein. The opensource study is published in the journal JCI Insight. Previous studies show that misfolded α-synuclein is found in enteric nerves before it appears in the brain. This suggests a model in which Parkinson’s disease originates in the gut and spreads to the central nervous system via cell-to-cell prion-like propagation. There is abundant evidence that misfolded alpha-synuclein is found in the nerves of the gut before it appears in the brain, however, exactly where this misfolding occurs is unknown. Past studies from the lab showed that endocrine cells in the gut epithelium also possess many neuron-like properties and connect to enteric nerves, providing a pathway to communicate with the brain, as shown in this time lapse video. The current study shows that α-synuclein is expressed in these endocrine cells in both the mouse and human intestine. The current study utilises cultured enteroendocrine cells of the mouse and human intestine which express α-synuclein. 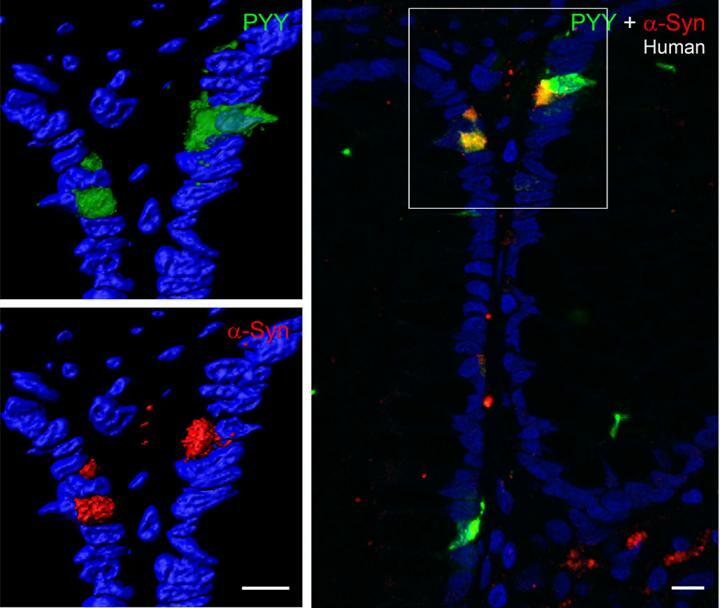 Results show that α-synuclein–containing endocrine cells in the gut directly connect to α-synuclein–containing nerves, forming a neural circuit between the gut and the nervous system. Data findings show that α-Synuclein is also expressed in enteric nerves and to a lesser extent in enteric glia. The lab explain that toxins or other environmental influences in the gut lumen could affect α-synuclein folding in these endocrine cells, thereby beginning a process by which misfolded α-synuclein could propagate from the gut epithelium to the brain. They go on to add that with their findings of alpha-synuclein in endocrine cells, the global medical community now has a working explanation of how malformed proteins can spread from the inside of the intestines to the nervous system, using a non-nerve cell which acts like a nerve. The team surmise their study shows that α-synuclein is expressed in mouse and human enteroendocrine cells of the duodenum and colon. They go on to add that some enteroendocrine cells are in direct contact with α-synuclein–containing nerves, which could lead to the transmission of aggregated α-synuclein from enteroendocrine cells to the enteric nervous system. For the future, the researchers state they plan to examine the gut endocrine cells from people with Parkinson’s to see if they contain misfolded and/or abnormal alpha-synuclein. They conclude that new clues about this protein could help the global medical community develop a biomarker which could diagnose Parkinson’s disease earlier. An image of tissue from a human colon uses fluorescent staining to show the presence of the protein alpha-synuclein (red) inside gut endocrine cells (green). Credit: 2017, JCI Insight.